HMAS Warrmunga’s Boarding Party prepare to conduct a boarding during the ship’s deployment on Operation Manitou. Image via Commonwealth of Australia, Department of Defence. Anzac frigate HMAS Warramunga has made more major seizures of illicit narcotics, bringing in three separate hauls valued as $294.3 million* over three days. 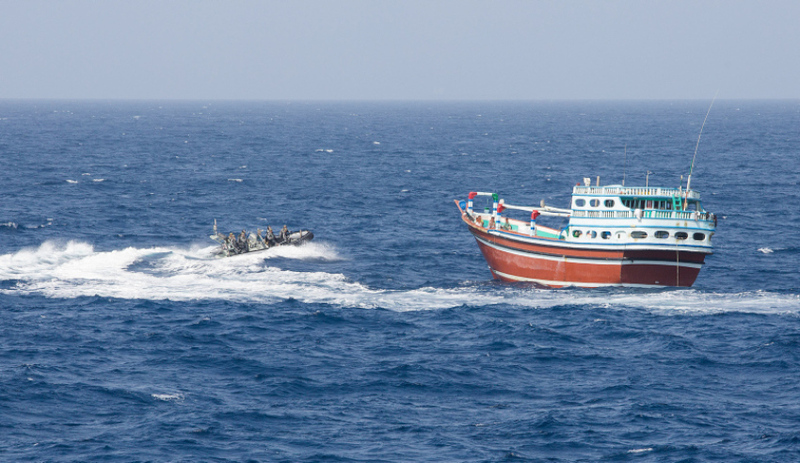 The boarding operations were conducted in international waters of the Arabian Sea from 3-5 June 2018. HMAS Warramunga is currently deployed to the Middle East under Operation Manitou. The first seizure uncovered 3.3 tonnes of hashish from a suspect vessel. Warramunga’s Seahawk Romeo crew identified the second and third suspicious vessels carrying 2.6 tonnes and 40 kilograms of hashish, respectively. Commanding Officer of HMAS Warramunga, Commander Dugald Clelland, said the ship’s company had shown determination and professionalism during the current patrol. "The crew of HMAS Warramunga has been on deployment in the Middle East for more than six months, but everyone onboard remains focused on the mission at hand," CMDR Clelland said. "Three successful seizures for Warramunga and taking over $2 billion out of the hands of terrorist networks lifts the morale of the crew, who have all worked exceptionally well together throughout the deployment." Warramunga has now intercepted, seized and disposed of approximately 31.8 tonnes of hashish and approximately two tonnes of heroin, valued at around $2.17 billion* since starting operations in the Middle East in November 2017. Warramunga is part of the Combined Maritime Forces operating under the UK-led Combined Task Force 150 (CTF 150).